The experiences of Astros prospects while on the Arizona Fall League's Scottsdale Scorpions. Welcome back to the Astros’ AFL blog. We are winding down here in Scottsdale with just a little over a week left in the season. This past week has been a fairly successful on for the Scorpions. We have been playing pretty well lately, and our record is steadily improving. If there is one ultimate truth in baseball, it is that there is always the chance that you will see something that you have never seen before. I have been a part of coutless baseball games over the past few years, but the other night at Scottsdale Stadium I saw something that I thought I would never see. We were tied with Phoenix in the bottom of the 11th inning. Kevin Frandsen was at the plate with runners on first and second. We are just one hit away from a hard fought win. For those of you who don’t know, the AFL has a rule that games cannot go beyond 11 innings in order to protect the pitching staffs. So at this point in the game, we literally can’t lose. Just as the four hour game was finally coming to its climax….. the lights went out. I’m not speaking mataphorically here. The stadium lights went out. So there we were, standing in the dark not knowing what was going on, waiting for the umpires to make some kind of decision. What was decided was that the game would be suspended until the next time we play the Desert Dogs. So tomorrow night before our regularly scheduled game we will play one half of an inning. That will be also be something that I have never seen before. I read the comments that were posted after my last post. Some of the questions in them were regarding where I thought I might be playing next year and even if I had a timetable to make the major leagues. Honestly, I try not to think about that stuff. Those aren’t my decisions so I leave them to the decision makers. I can only try to make the most of these last few games out here in Arizona and then get as prepared as possible for Spring Training. That’s it for this week. I’ll be back again next week for my last entry. I’ll see you all then. Hey fans, this is Drew Sutton. I play with the Scottsdale Scorpions and am in the Houston Astros organization. Having been in the Minors for a few years now and having traveled what seems like all over the country, you get in a habit of trying to find some great local spots once you get to town. Whether they be good live music venues, attractions that really personalize a town or local restaurants. That’s what I really enjoy about traveling so much to so many different cities, finding the Mom and Pop places that really define a city and give it a special nuance all its own. In Springfield, Missouri there’s the house turned restaurant, Gaileys, that serves amazing breakfast. In Nashville, there’s ‘The Blue Bird Cafe’, one of my favorite places, where four local songwriters will come in at a time with just themselves and a guitar and sing some songs they have just written and some that have already been recorded by artists like George Strait or Kenny Chesney. And in Corpus Christi, there’s Mulligans, where we were constantly running the juke box with sing-a-longs from Bob Marley, Tom Petty, Oasis, Black Crowes and pretty much anything else you can think of. That’s the great thing about being here in Scottsdale for the first time, the search for the local spots that make Scottsdale unique as a town. I really like that the weather is always nice enough to sit outside at all of the restaurants that line Scottsdale Road. The two places I really try hard to find are a breakfast spot which I think I’ve found in ‘The Breakfast Club’ and a good live music place which I’m still working on. I have heard that there is good live music at Camelback Inn through the week. These are the kinds of things that make it a little bit easier to be away from home since February and it helps to keep you a little sane during a 142-game season. Well, with only 2 weeks left we’re running out of games before it’s time to hibernate for the winter and then before you know it Spring Training will be here. Then it all starts over again with new towns and the search for the local dives. Have a great winter, fans, and we’ll see you in the spring. Welcome back for the fifth entry of my AFL Blog. Not too much has changed here since my last post. Out here in Arizona, and during the regular baseball season, we spend so much time at the field that all of the days seem to run together. From Monday until Saturday, it seems we spend all of our time at the stadium. We do manage, however, to get out a little bit. Here in Scottsdale there is alot to do and over the past few weeks we have all tried to get out a little bit. The restaurants here are great, and the nightlife is pretty good as well. It’s nice to be located in such a nice area. Many of the cities that we find ourselves in throughout the Minor Leagues don’t have as much to offer as the Scottsdale/Phoenix area. I even managed to get up to Sedona for a short trip recently. It was beautiful. I just wish I had a little more time to spend up there. As for the Scorpions, we continue to be up and down. Sometimes we play very well, and sometimes we don’t. There is no lack of effort, however, as everyone still shows up everyday ready to play hard. The AFL all-star game has come and gone which means that the season out here is about halfway done. The first three weeks have gone by so fast that I’m sure the end of the season will be here in no time. With such a short amout of time left, our coaching staff has been stressing to us how important every day is. We are still being evaluated daily, and every time we are on the field is a chance to improve. Our record is a bit discouraging, but there have been many bright spots. Many good individual performances have been turned in, and on occasion we have played very well as a team but just come up short of a victory. I guess that’s also part of the development process, being able to stay focused and keep working when things aren’t necessarily going great. I wish I had more to tell, but honestly that’s about it. If there is anything in particular that you all would like to know just write a comment and ask. Otherwise, I will check in again next week. Have a safe and happy Halloween. Welcome back for my third entry in this AFL blog. I’d first like to thank Chris Blazek for being a guest blogger here earlier in the week. Very well done, Blazer. Our second week of playing out here in Scottsdale was alot of fun. We won a few more games than last week, which will always make for a good time. Many of the players out here, on our team and others, continue to impress. The talent out here is everything that it’s made out to be. Personally, I have gotten back onto the field. After missing about a week and a half with a hamstring injury, I was cleared to play a few days ago. It’s great to get back out there. Anytime you sit out a few games, you realize how much you enjoy playing. During the course of a long season a day off here and there is nice, but out on the field is where everyone wants to be. Our team is having alot of fun together. The atmospehere in the clubhouse is pretty laid back. This afternoon Kevin Frandsen brought in his ping pong table from home, and the games are already getting intense. Another thing that comes along with getting to know eachother is the pranks. The other day, Chris Johnson got his shoe lit on fire in the dugout by a teammate who will remain nameless. You have to stay on your toes around this group. I read a few of the comments from my last post and some people were asking about the transition from pitcher to outfielder. I love it. It’s been alot of work, but I’ve been having fun. I guess the thing that I like most about it is being able to play everyday. Sitting for four days in between starts was tough for me. I like knowing that everyday I show up to the field there is at least the chance that I’ll be in the lineup. Who knows where I’ll end up as an outfielder, but I know that at the very least I’ll be enjoying myself. That’s about all for me for this week. I’ll talk to you all again next Wednesday. Hello astro fans this is chris blazek coming from scottsdale, Az. I would like to first start out by telling you alittle about myself, I am from Litchfield, CT and attended the university of Vermont. Outside of baseball I spend most of my time outdoors usually fishing. I would have to say that the weather down here is alot easier to play baseball in than back home this time of year. Arizona is 85 to 90 degrees everyday and not a cloud in the sky, I am truly enjoying my first time visiting AZ. This weekend I am planing on visiting sedona national park about 2 hours away to do some off-roading and hiking. It is now the Third week of the arizona fall league and our team the Scottsdale scorpion’s are playing much better baseball, our record has improved to 5-8 after an 0-3 start. Many of the astro prospects have made great contributions to the scorpion’s, drew sutton has hit 3 HR so far including 1 today in a 11-2 win. Chris johnson had another multiple hit day today as well. Bud Norris has wasted no time getting used to coming out of the bulpen out here looking sharp in all 3 of his outings and will be representing Scottsdale in the Arizona Fall league all star game this friday night. It has been an quite a privledge and an honor to play with the likes of fellow big leaguers such as clay bucholtz, and agianst others such as phillip houghes. We have altleast 5 guys that have broke into the big leagues on our roster that i know of and more in the near future, that I am certain. After a full week out here in Arizona, I wish I had more than just one at bat to tell you about. Unfortunately, that is not the case. In the second to last game of the regular season in Corpus Christi I tweaked my hamstring a little bit. It was reaggrivated the other day and I had to come out of my first game here after just three innings. I don’t think that it is a very serious injury though, and hope to be back on the field within the next couple of days. Since then, most of my days have been spent getting treatment and rehabbing so that I can be healthy as soon as possible. It’s been a tough first week for the Scorpions. We have won just one game so far, but that doesn’t mean that we haven’t done a lot of very good things on the field. Many of the players have turned in very good performances in our first seven games. We have been in almost every game right down to the end, but we just haven’t been able to pull out many wins. When you have a group of about 40 players coming together from five different organizations it is hard to develop team chemistry in just a few days. I have a feeling that very shortly we will develop more of an identity as a team and therefore start winning on a much more regular basis. You can see the players from the five teams mixing more than a week ago. During our first couple of practices our stretch circle was clearly segregated into seperate organizations. By now everyone has gotten more comfortable around each other and is interacting as if they’ve known eachother for much longer than a week. I think that things like that are good signs that we are becoming a team, so hopefully that will result in more wins. The day to day schedule here is different than during the regular season. With so many day games I have found myself with more free time in the evening. My roommate, Sergio Perez, brought his Playstation 3 out here with him and we have been going head to head in Madden Football almost every day. I don’t think I’ve played a video game since Super Nintendo but since we started playing I’m a perfect 5-0 aginst Sergio. He is not very happy about that. That about sums up this past week. Keep your fingers crossed that next week brings more success in real life baseball than in video game football. Greetings from Scottsdale, Ariz. My name is Brian Bogusevic and I’m the Houston Astros’ representative for the Arizona Fall League MLB Blog. I guess I’ll start by introducing myself to all of you. 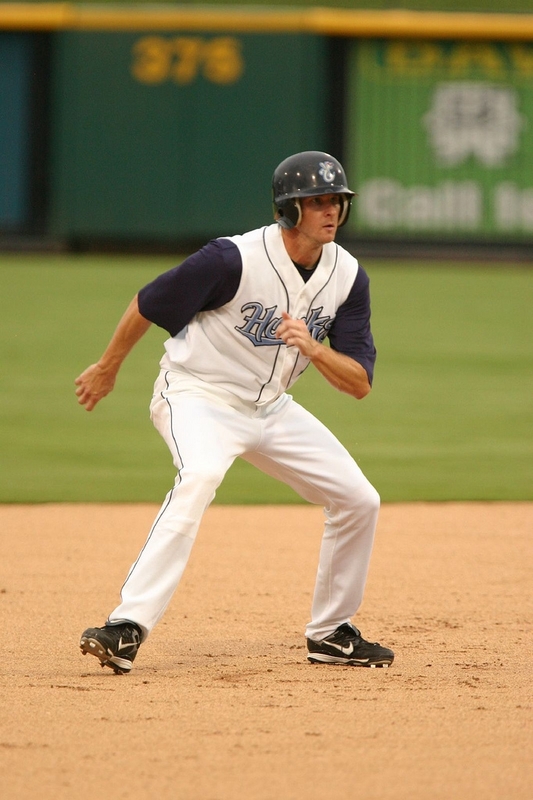 I am an outfielder in the Astros’ farm system and finished the 2008 season with the Double-A Corpus Christi Hooks. My road to the AFL has been an eventful one. I was drafted in 2005 as a pitcher. After two and a half seasons on the mound, I was converted to the outfield in July. I’ve really enjoyed being a position player thus far, but the conversion is still very much a work in progress. That about sums me up. Now on to the Fall League. We have been out here in Scottsdale for about a week now. We reported here on Oct. 1, and got to work almost immediately. The first few days consisted of practices, moving in to apartments, and meeting new people. Our team is the Scottsdale Scorpions and it is made up of players from the Astros, Red Sox, Pirates, Angels and Giants. With so many guys coming from so many different places, it’s a ton of new names and faces. Some guys I recognize from playing against in the past, and some are total strangers. That is one of the great things about professional baseball. There is never a shortage of new people to meet. Tonight was our first game. Unfortunately we lost, 9-3. From just one game, I can see that the level of competition out here is very high. All of the pitchers who threw had really good stuff, and the hitters had very advanced approaches and consistently made hard contact. I didn’t play tonight, but hopefully I’ll get the chance to measure myself against the competition tomorrow. That’s it for now. I’ll be writing again soon. Hopefully my next entry will be filled with much more baseball and not so many formalities.